dei Miracoli, or Field of Miracles, where the Duomo, Baptistry and Camposanto complete a dazzling architectural ensemble. 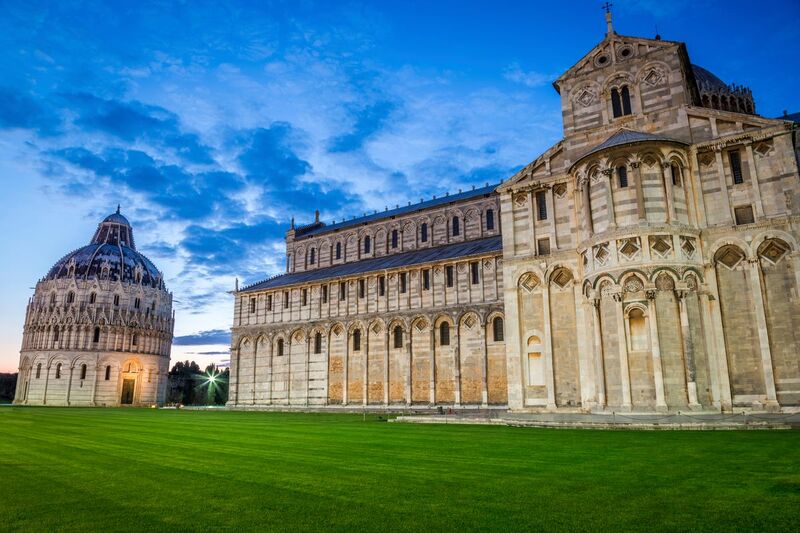 These amazing buildings belong to Pisa's Golden Age, from the eleventh to the thirteenth centuries, when the city was one of the maritime powers of the Mediterranean. There are over 20 other churches and palaces in Pisa and numerous bridges crossing the Arno. After soaking up the history and architecture you can explore some of the restaurants and shopping or just kick back and enjoy the views. offer an ideal combination of good weather, with temperatures around 73F (23C) and fewer crowds. The month of August and Easter are both important holidays for Italians, so expect to book far in advance, while visiting in winter will afford the lightest crowds and cool but not freezing temperatures at 45F (7C). The main point of visiting Pisa is to come to see, and take a picture with, the famous leaning tower! I’ll admit that when close friends were considering Pisa as a honeymoon destination my advice was to opt for the romance of Florence/Firenzeinstead, but for those not on a honeymoon, Pisa’s railway junction makes it a great base for exploring by train. There are frequent trains between Pisa and Florence/Firenze and the journey time is only 45 mins. The fact that price difference in average hotel rates can enable travellers staying in Pisa to save money, even when the train ticket prices to/from Florence/Firenze are factored in to the equation, is a good reason for opting for Pisa, but it is far from the only one! There are multiple spectacular destinations, other than Florence, that can be accessed from Pisa by train.